McElroy_Recover1.jpg: Here is a an installed 238T recover over R-panel by Titan Roof that utilizes McElroy Metal’s transverse panels behind curbs to provide long term performance. McElroy_Recover2.jpg: Here form-cut EPS is laid in place prior to installing 238T panel and clips on an R-panel recover. McElroy_Recover3.jpg: Here is a Roofmasters job where 238T retrofit clips are pre-installed on ribs of existing trapezoidal panels. McElroy_Recover4.jpg: Here is a recover with new 238T light strips installed over old skylight locations. BOSSIER CITY, La. 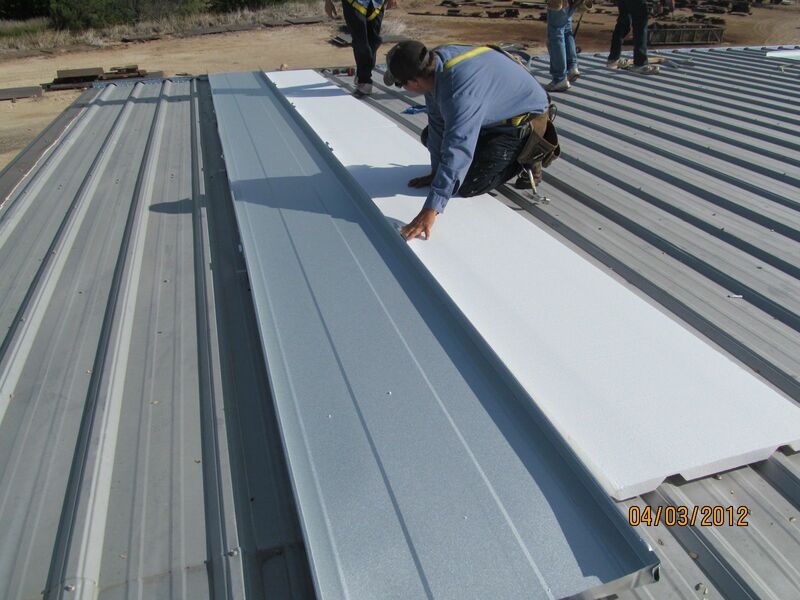 March 10, 2015 – There are acres and acres of metal roofing systems, many up to 50 years old, which have recently become in need of some maintenance. Building owners looking for quick fixes have some inexpensive and temporary options. 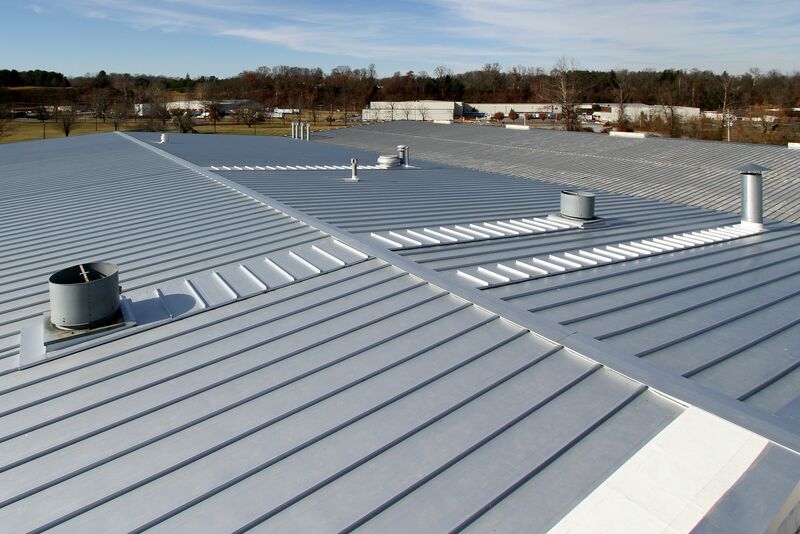 The innovative minds at McElroy Metal have developed some long-term options that allow metal roofing installers to compete with roofers offering short-term, non-metal systems. During the past year, McElroy Metal has received patents on two frameless systems to recover the most prevalent metal roof panels in open frame metal buildings: exposed fastener R-panels and 3-inch tall trapezoidal standing seam. Both systems weigh about two pounds per square foot. “Basically, we use tall clips, fasteners and insulation,” Smith says. “A major advantage in these systems is not having to add edge or corner framing to meet the wind uplift pressures on the vast majority of existing buildings with 5-feet on-center framing. Metal buildings became a popular and economical method of construction in the 1960s and early 1970s. The R-panel and trapezoidal standing seam roofs on these buildings are showing their age. Metal roofing manufacturers have been able to offer several options to repair these roofs, everything from the expensive tear-off and re-roof, to the metal-over-metal recover through the use of sub-purlins between the old and new roofing system. Metal offers the best long-term solution, but price often pushes building owners to look for less expensive options – mostly temporary alternatives to metal. Single-ply systems have been winning a large portion of these re-roofing jobs, according to Smith, and it’s all about price and perceived value. “Single-ply may not be the best solution in many of these cases,” Smith says. “There are aesthetic as well as attachment issues. Also, these structures are designed to have water flowing down individual panels. Without individual panels, water tends to flow toward the mid-span of the purlins over time and this has caused a number of collapses of single-ply recovers over trapezoidal roof panels. Smith says that evens the playing field and provides a roof that will last for many decades, as opposed to a single-ply system with a much shorter life expectancy. Titan Roof of Nashville, Tenn., has been using the 238T panel to recover both R-panels and trapezoidal panels. Vice president Ches Booker says this method of recover saves his crews time and saves the customer money as compared to employing a zee purlin retrofit system. The 238T Retrofit Clip is what sets apart the metal recover system from McElroy Metal. The 238T Retrofit Clip works with the company’s symmetrical panel system by sitting between the ribs of the existing roof and holding the new panel above the ribs of the existing roof while attaching to the purlin below. When installing over an existing R panel, the ideal width for the 238T panel is 24 inches, with clips attached to the purlins between every other rib of the R-panel. This system eliminates the need for sub-framing. Booker says Titan Roof can install single-ply roofing as well, but generally educates the customer to make the long-term choice for a similar price. “We use iso insulation with single-ply roofing and it’s expensive and requires a lot of fasteners.” He says. “The sub-purlins also require a lot of fastening. With the 238T and the tall clips, we can use special form cut EPS or roll out an unfaced batt insulation. That saves time and money. 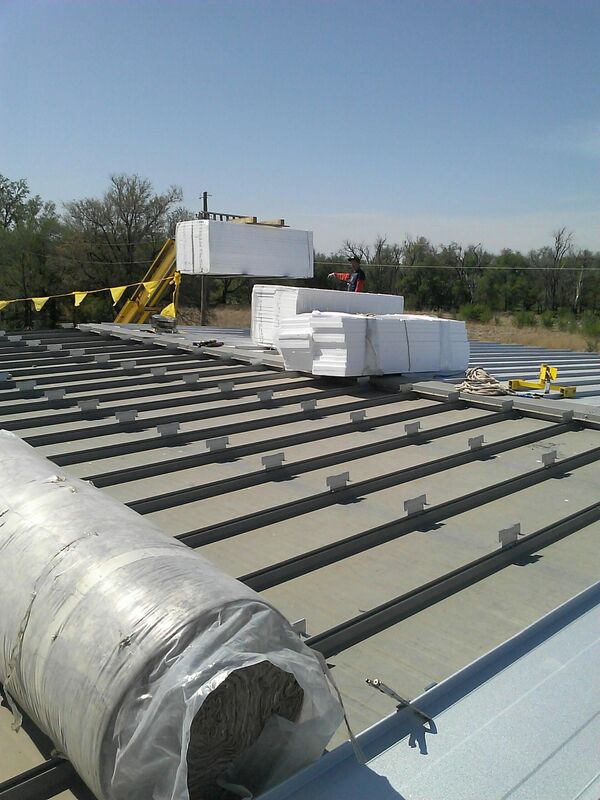 Roofmasters Roofing and Sheet Metal of Hays, Kan., has installed the 238T panel over R panels and trapezoidal panels as well. Roofmasters owner Lucas Haines says he also has installed plenty of single-ply membranes and sloped metal framing with metal roofing. The 238T panels allow Roofmasters to stand out from the competition. These metal recover systems can be installed over the traditional trapezoidal and R-panel roofing systems, the popular options for these aging metal buildings. McElroy Metal’s entire system is designed for speed of installation and reduced cost. In either case, the new roof will have no end laps because the panels can be site-formed in continuous lengths onto the roof using one of McElroy’s jobsite production vehicles. It should be noted there are different steps for recovering trapezoidal and R-panel systems. Over R-panels: First, cut back R-panels to the wall and install special Roof Hugger on eave strut. In high wind uplift zones, pre-install continuous clips between every other rib of existing R-panel, then infill between clips with either 24-inch wide form-cut EPS or 24-inch by 3-inch unfaced batt. Then snap panels in place and put the seam covers on. In normal applications where individual clips are used, lay insulation first, then lay panel and attach clips like normal into the purlins between ribs of R-panel. Install the new post-hung gutter last. This is an extremely fast install and McElroy Metal has witnessed production at or near 1,000 square feet of roof installed per man, per day on numerous jobs. The system to recover R panels also increases wind uplift capacity of the original roof without adding framing, up to approximately -91 psf allowable at 5 feet on center purlins. Over trapezoidal standing seam: Cut back the roof panel to the wall and install special Roof Hugger on eave strut. Pre-install clips: set 1-3/4 inches offset individual or continuous clips on female shoulder of trapezoidal panel and fasten clip sideways through seam and down into shoulder over each purlin location. Next, fasten the existing panel down to the purlins, lay in 2 inches of EPS or iso into bottom of trapezoidal panel, roll out in 3-inch by 24-inch wide unfaced batt over top of EPS running up and down panel. Snap the 238T (24-inch panel) panel into clips and install caps. This also is a very fast installation. Gutters can be installed after the roof is completed. “Preliminary base testing indicates this system increases the load carrying capacity of the purlins between 25 to 40 percent and increases the wind uplift capacity of the old roof … without added framing,” Smith says. “The system to recover trapezoidal panels increases wind uplift capacity of the original roof without adding framing, up to approximately -85 psf allowable at 5 feet on center purlins. Many of these 50-year-old roofs were initially installed with skylights. Because the building owners relied on that natural lighting, they don’t want to lose it. The 238T recover system allows for skylights to be retained at a low cost, with a low leak probability. In fact, the amount of natural lighting introduced may be greater with the introduction of a 238T light strip. The light strip is composed of polycarbonate sheets formed into the same shape as the 238T roof panel and mounted sideways, above the roof plane. This gets them up out of the water flow and makes it easy to fix or replace individual light panels … and it can be installed to greater lengths, allowing more light into the building. McElroy Metal is now offering a limited number of 238T licensing agreements. Contact Charlie Smith at clsmith@mcelroymetal.com if you have an interest in this type of opportunity.